Dalma -a heavenly blend of lentils and green vegetables. The first time I heard of it, I was surprised that dal could be used in this form too. Thus far we had been sampling lentils as simple lentil curry or as dal makhni, which is widely popular in Punjab. But dalma is different. It was never thought of in my mom's home in Punjab, but now dalma curry has become a regular there. 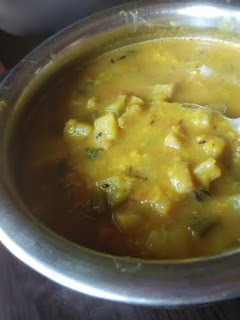 After having tried out dalma the tradition way, it was high time I OPOSed the curry from Odisha. 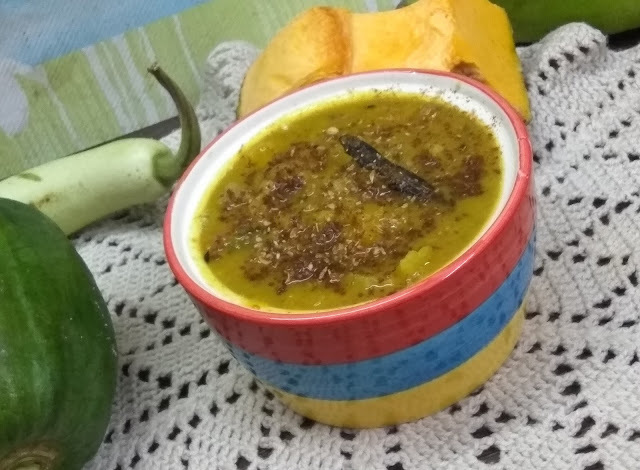 The courage I have got from OPOS recipes tried and tested by me several times was instrumental in helping me unlock the dalma recipe the OPOS way. Voila! 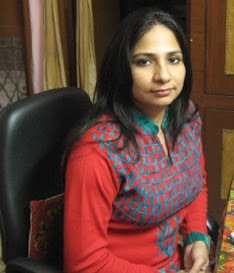 I made it once and it was loved by Odiya hubby - which gave me the confidence to try it out again and again. Have I ever looked back at making dalma other than OPOSing it. Na, not even thought of doing so! 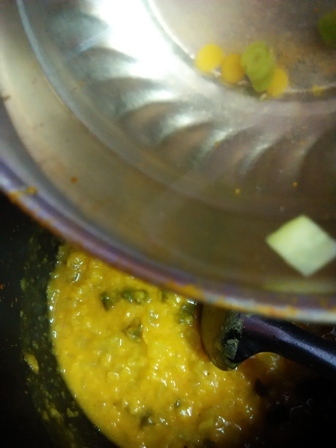 When I got married to an Odiya, I got to taste this unique blend of vegetables and lentils. 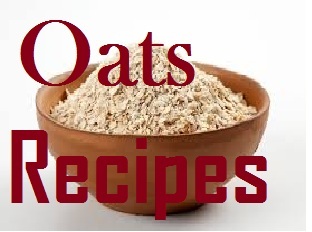 I fell in love with the simple recipe, which is bursting with flavors and is full of health. 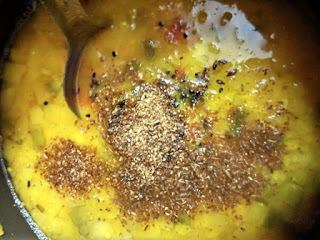 I must say it is one of the best ways to hide lentils in this curry and serve it to your fussy eaters. Nobody can say it is dal only. Another reason to make this dalma Odiya recipe is its lavish use of green vegetables - the veggies that aren';t too popular in our homes - lauki (bottle gourd), pumpkin (kaddu), raw papaya, raw banana or plaintain. You may or may not add potato. 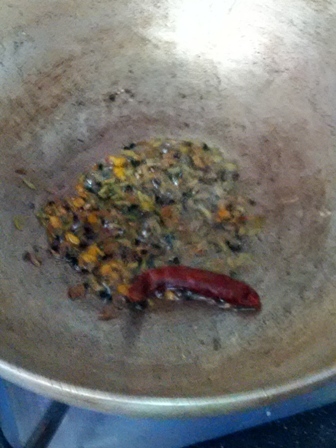 Odiyas typically use vegetables that are available in plenty there. I could get my hands on only these veggies here. Again, this santula bhaja is such a simple Odiya recipe, which is teeming with flavors and provides you a healthy blend of green vegetables. 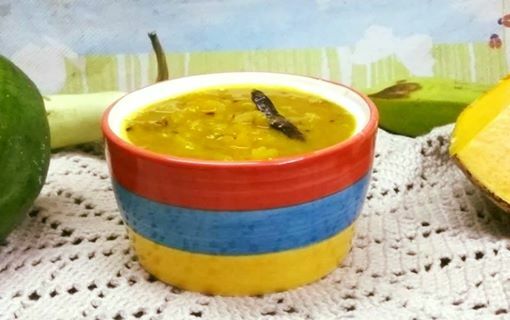 Enjoy it with dalma curry as a side dish or even sambar. 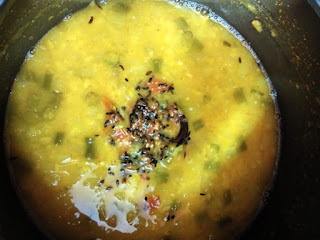 I often make bhaja santula with simple dal or dalma. 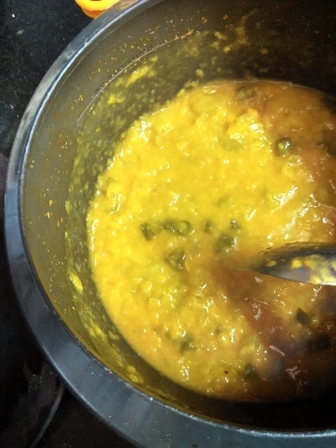 Often kids do not like to eat dal. Then there are a few vegetables that they run away from. 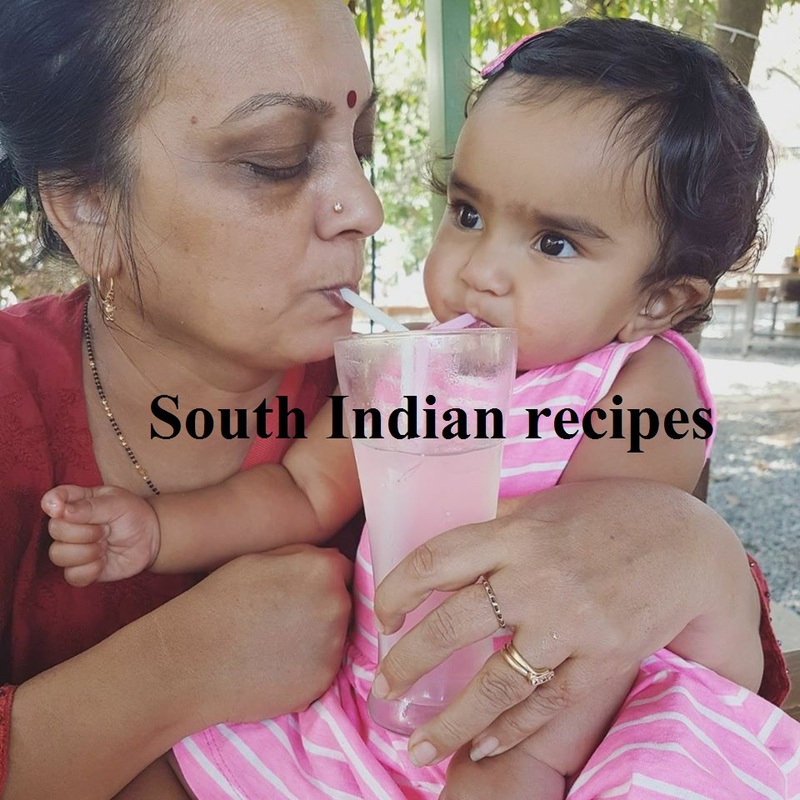 So why not blend them all together and make DALMA - ODISHA's specialty? It's a real treat for your kids and enough to tempt your taste buds. 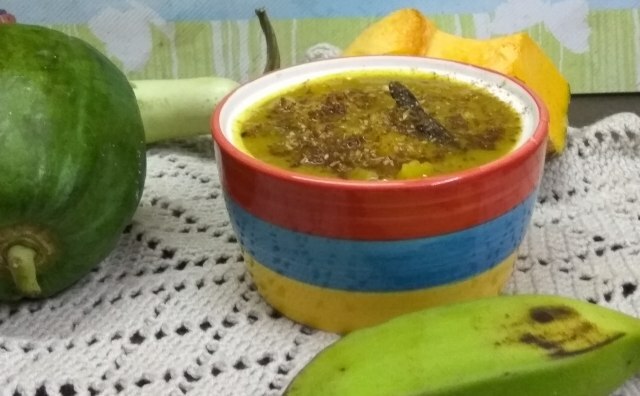 I am sure you will love DALMA for its sheer taste and health benefits, since all the vegetables are boiled. 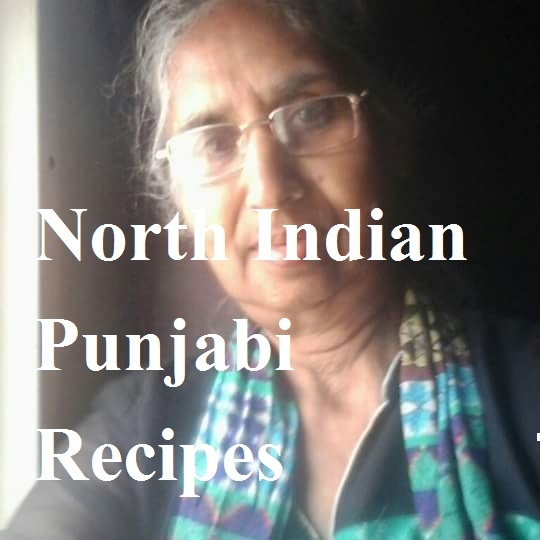 Enjoy dalma with boiled/fried rice or chapati/naan. What's so unique about dalma? 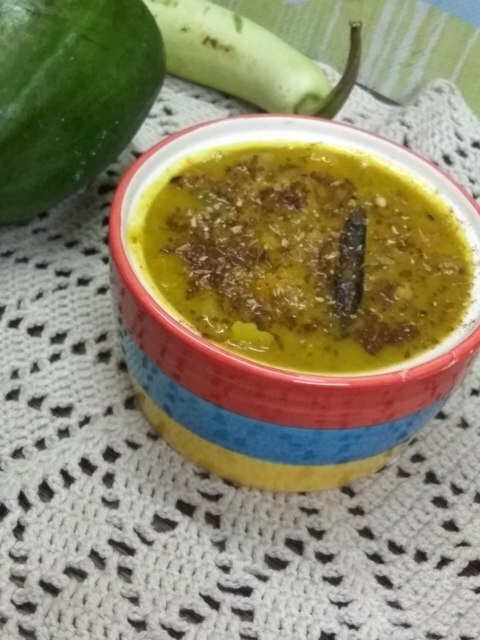 The addition of roasted jeera powder, coriander powder, and red chilly powder at the end is all you need to add the required flavor to the dalma curry. 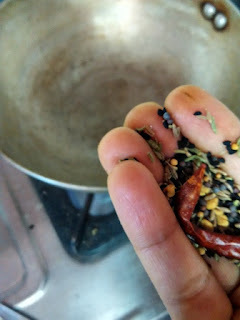 Soak arhar/tuvar dal for at least one hour. Cut all the vegetables into small pieces and wash.
Take a 2- or 3-liter pressure cooker. Start layering - first, place the dal at the bottom. Drop one bay leaf as well. Add one whole tomato (no need to cut it). You may add the tomato here or in the inner bowl that we will talk about next. 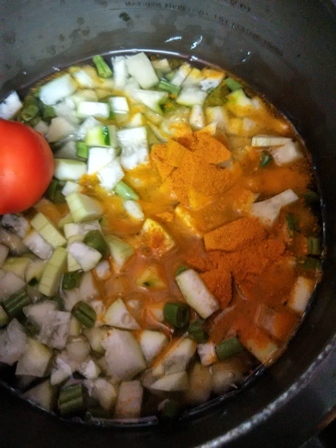 Add turmeric and little water enough to cover the vegetables. 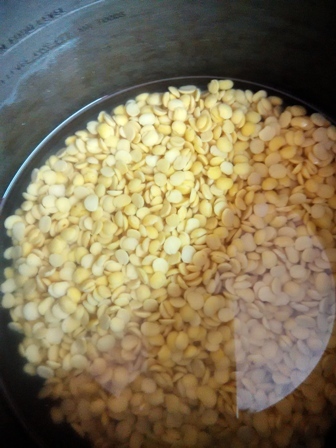 You do not want to flood the dal - add enough water that soaks all the ingredients. 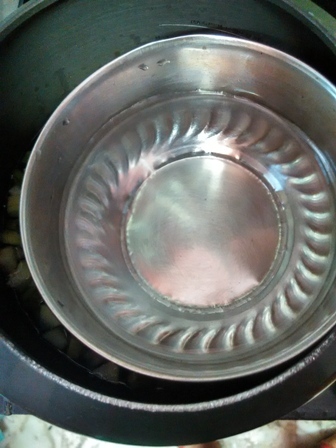 Take another bowl that can easily fit in the cooker. Pour the remaining water in that bowl. Cover the lid with weight on (whistle). Pressure cook on a high flame for 6 whistles. Allow the pressure to release on its own. Remove the inner bowl. Try to mash the dal with a laddle. Immediately add the hot water from the inner bowl. When the oil is hot, add , methi dana, kalonji, or panch phoron and degi mirch or red chilly. Let the spices splutter. Turn off the flame. Gently mix. Enjoy awesome flavors in this wholesome curry. 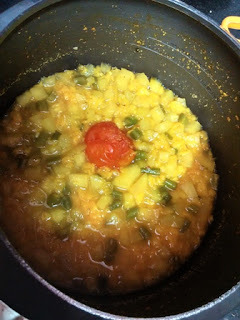 You may add fresh coconut for a rich version of dalma. It tastes absolutely delicious with or without coconut. Do give this lip-smacking marriage of vegetables and lentils a try.